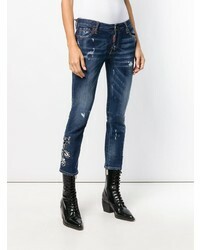 If you're in search of a casual yet chic getup, dress in a brown coat and Dsquared2 cropped skinny jeans. Both garments are totally comfy and will look fabulous paired together. Bump up the cool of your outfit by wearing brown suede ankle boots. Choose a white cropped top and navy ripped skinny jeans, if you feel like relaxed dressing without looking like you don't care. If you're on the lookout for a casual yet totally stylish look, dress in a brown blazer and Dsquared2 cropped skinny jeans. Both garments are totally comfy and will look fabulous paired together. Got bored with this getup? Enter beige leather heeled sandals to change things up a bit. If you're all about relaxed dressing when it comes to your personal style, you'll love this extra cute pairing of a white oversized sweater and Dsquared2 cropped skinny jeans. Rocking a pair of grey suede ankle boots is a simple way to add extra flair to your outfit. If you're obsessed with practicality dressing when it comes to your personal style, you'll love this absolutely chic pairing of a grey knit open cardigan and Dsquared2 cropped skinny jeans. Rocking a pair of grey suede ankle boots is a simple way to add some flair to your outfit. If you're on the lookout for a casual yet chic outfit, wear a white and red and navy plaid dress shirt and Dsquared2 cropped skinny jeans. Both pieces are totally comfy and will look fabulous paired together. Choose a pair of white canvas low top sneakers to make the look more current. 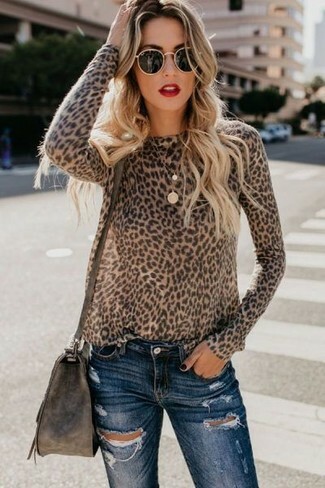 If you're all about functionality dressing when it comes to fashion, you'll love this extra adorable combo of a white off shoulder top and navy ripped skinny jeans. Kick up the cool of your outfit by finishing off with brown leather pumps. 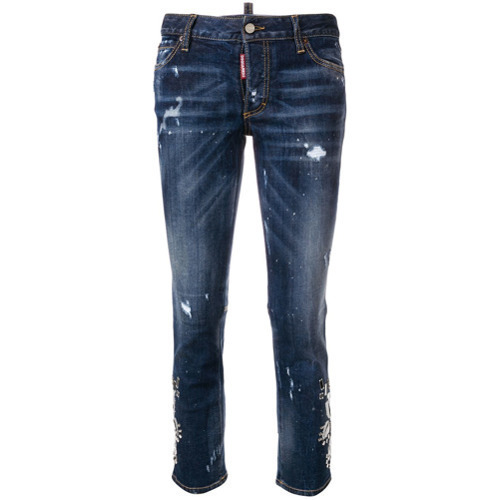 Pair a brown leopard crew-neck sweater with Dsquared2 cropped skinny jeans for a comfy-casual look. 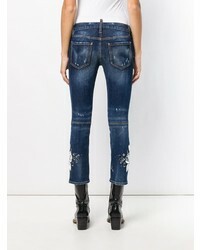 If you're after a casual yet totally stylish look, pair a blue denim shirt with Dsquared2 cropped skinny jeans. Both garments are totally comfy and will look fabulous together. Bump up the cool of your getup by finishing off with tan leather pumps.